This fishing light with super bright LEDs to attract a wide range of marine life, making fishing more easily. 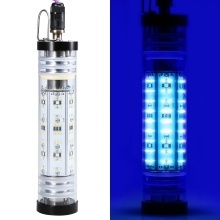 140W/200W/300W high power, super bright LED fish lure light, efficient to attract a wide range of marine life. 6-sided LED fishing light creates a massive 360 degree underwater glow that will soon lure in circling bait fish. Sealed tightly, fully submersible and waterproof without any water leakage or moisture. 5-meter long cord makes it possible to drop as deep as needed. High grade PC and stainless steel construction for excellent performance in the water. Perfect for boats, kayaks, canoes, and dock fishing.